Arieana Arabians ~ "Haat Pursuit"
"I am almost two years old today ~ aren't I absolutely gorgeous? 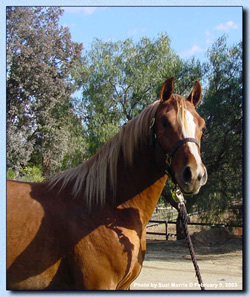 Although I am registered as Haat Pursuit, I am known around The Ranch as "Hollywood Cruiser" for my flashy-golden, handsome good looks. I love my life in the bachelor band pasture with the other colts and geldings, I love people, and I especially enjoy being ponied on those trail rides out and about The Temecula Valley when I get to go along with all those other horses and their riders. And do you know what I get to do for a special treat? I get to be trailered into town for ice cream. Yum! Yes, life is good ... very, very good. From what I hear, I am headed for a career at the racetrack next year because I really know how to turn the speed on when and where it counts! I hear they will even take pictures of me in the Winners Circle, and since I love to show off my beauty and my brawn for photographers, that's exactly where I intend to be when the race is over. Oh, this all sounds like so very much fun to me; doesn't it sound exciting to you too? And after that? I hear there is a very special princess waiting for me on the horizon, but first I must prove my worth and merit with a creditable performance career. But that should be no problem as I love to work, I love to please and learn new things, and I am built to get the job done and do it with elegance and style. They also tell me I'm Sweepstakes Nominated and tested SCID Clear, CA Clear, and LFS Clear. I'm ready! I do apologize to you all as my official webpages are still under construction, but my pedigree with its 13 crosses to Gulastra is here so you can read about my family history. And do please come back soon to see the rest of my photos and read the rest of my story as my mom says those pages will be ready soon!" (February 15, 2004). Time has passed so quickly! I now have a wonderful new home with Tim and Kristi Johnson in Berlin, WI. (October, 2011). Saqlawi Jidran. CMK and American Foundation. Thank you for visiting us here at the website home of Arieana Arabians. 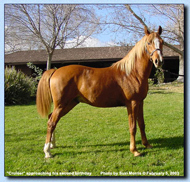 We hope you will return often, for more is planned and will be continually added to our website as we go forward with Arieana's CMK Heritage Notebook, a special section of articles and links on The Original Racehorse, and our Southern California CMK Heritage News On-Line. Copyright � 2003-2012. Website designed and maintained by Suzi Morris and all rights reserved. This page created January 2004. Updated and current as of August 20, 2012.